Having a Lot of Fun(dy) . . .
Not much happened today. At least not enough to really blog about. On the way home from Clear Lake I made a stop at the Fry’s Electronics in north Houston to pick up a new power supply for the Mystery Machine. So hopefully I’ll know what’s on it this coming Friday, my next trip down there. So I’m reposting our visit to the Bay of Fundy back in September 2009. Today is our last full day in Canada for a while, and is also our day to visit the Bay of Fundy area. 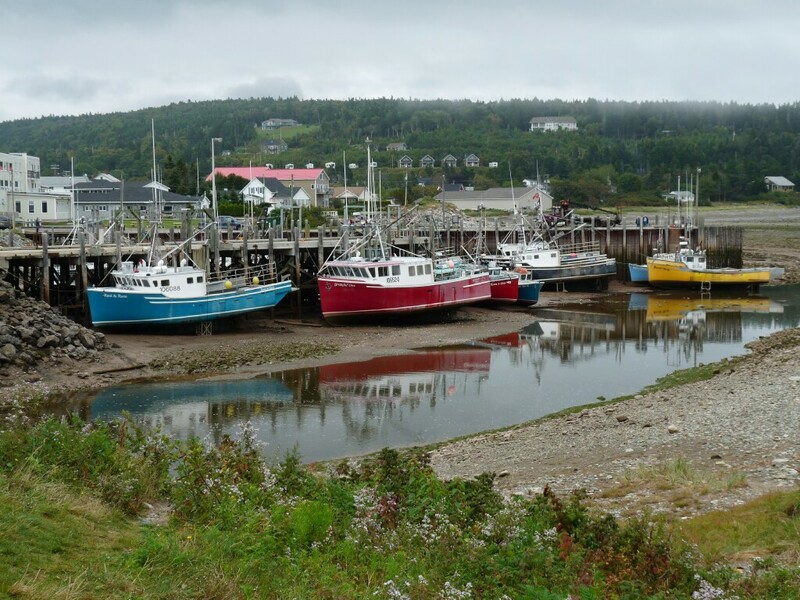 The Bay of Fundy is home to the highest tidal changes in the world. In a 6 hour period the water level can change 30-50 feet depending on the phase of the moon. But first we decided to try a place we’d heard about here in Canada called Cora. Cora is a type of restaurant that seems very popular here in Canada. It is only open for breakfast and lunch. It closes at 3 pm every day. And it was fantastic. The food is delicious, and every menu item is a work of art. Hopefully we’ll be able to eat here for breakfast tomorrow before we leave. 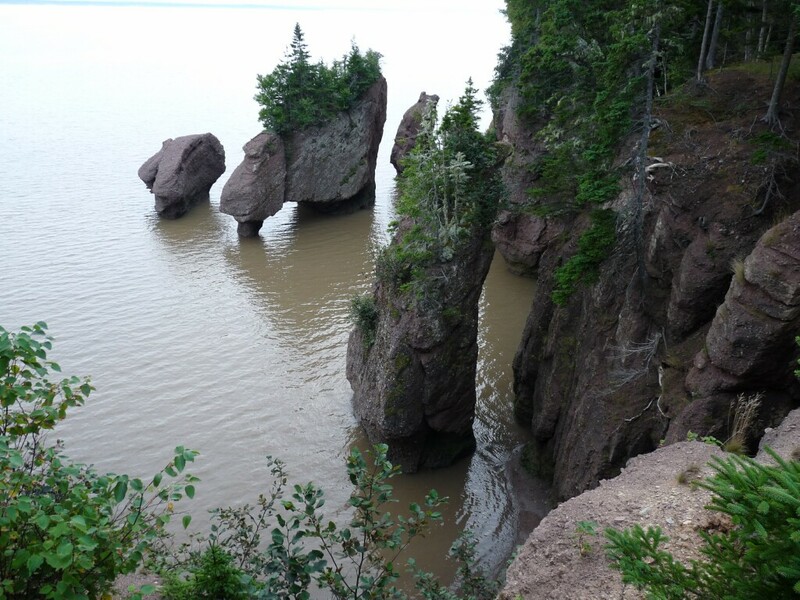 After breakfast, we made the 30 mile trip south to the Hopewell Rock area of the Bay of Fundy. On the way, we drove along the Chocolate River, which seems very aptly named. As it was low tide and this river connects with the Bay of Fundy, it was basically a chocolate-colored mud flat. And here is what it looked like coming back home. We arrived at Hopewell Rocks about 1 pm, a little before the full low tide point at 1:41 pm. The trail down to the Rocks is about 3/4 mile though the forest. Getting there, here is what we saw. If you put your mouse cursor over one of these pics and it says ‘Click to Enlarge’, doing so will give you a larger version. Use your browser Back Arrow to return to the blog. Try it! Then we walked down the 125 steps to the ocean floor. By the time high tide occurs, the water level will be to the top of the narrow sections of the rocks above. There are a number of warning signs in the area. Apparently people are often caught on the ocean floor when the tide comes in. Someone said that someone drowned here a couple of weeks ago. Because it would be a little over 6 hours until high tide, we drove further down the coast along the Bay of Fundy. On the way we passed a couple of number of scenic views, including a couple of 100-year-old covered bridges, one of which is still in use. 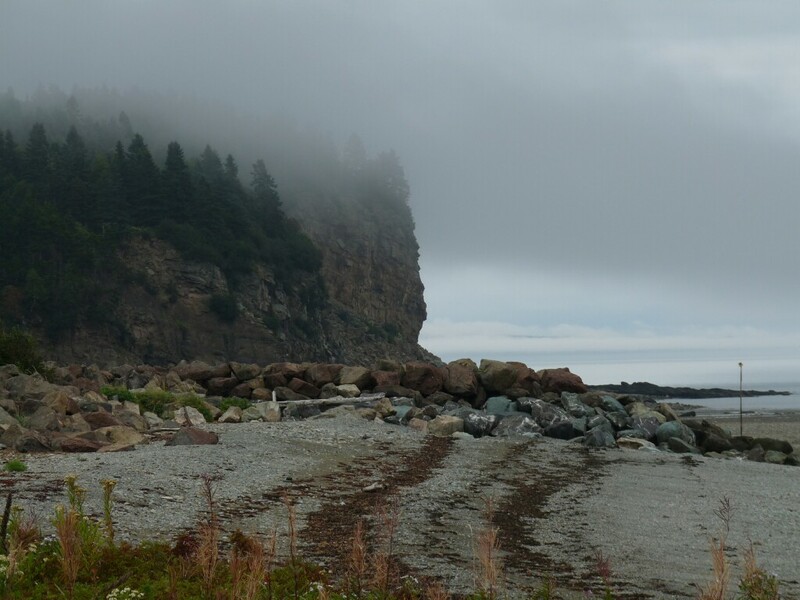 As we neared the Bay of Fundy National Park, we came across these scenic areas. The first is a view of a cliff-side shrouded in the fog that had settled in as the day progressed. Nearby was a boat dock that shows the problem of mooring boats in an area where the water level varies 30-50 feet twice a day. 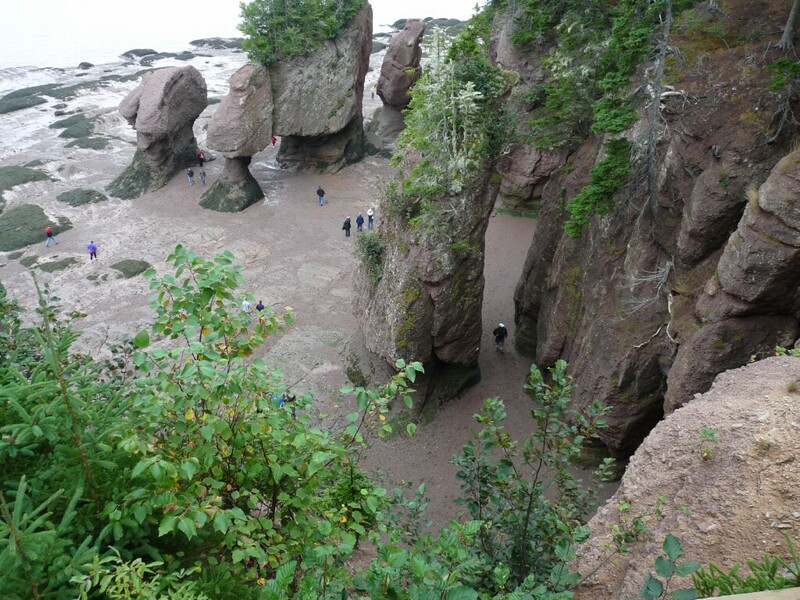 Finally we headed back up the coast to Hopewell Rocks to see the results of the tide coming in. Unfortunately we weren’t able to stay for the full high tide because it would occur after dark, and there is no lighting at the Rocks, or on the 3/4 mile walk through the woods to the parking area. The only downside to our visit was the fact that as the sun went down, the mosquitos came out…with vengeance. You’d think they hadn’t eaten in a year, but they certainly made up for it that night. We stayed as late as we could. In fact it was downright dark by the time we made it back to the toad. I’d always heard of the tides at the Bay of Fundy and it was neat to be able to see them for ourselves. But, maybe the best thing about our Bay of Fundy trip is that Jan finally got to see a Canadian moose! Tomorrow we head back to the good ole USA.